(1feb03) In this issue we will take a look at a new type of Bolger cabin. In the 15feb03 issue we'll rerun an old article about estimating the weight of a new design. ... can now be found at Duckworks Magazine. You order with a shopping cart set up and pay with credit cards or by Paypal. Then Duckworks sends me an email about the order and then I send the plans right from me to you. Jerry Champion's Piragua on the Alabama coast. Phil Bolger, who taught me about everything I know about boats, writes a column in each issue of the great paper magazine Messing About In Boats (which you can subscribe to through the Duckworks website). A few years ago, maybe five, I recall seeing the first of a new type of cabin on his boats. It was an add-on to a modified Micro design that he called called the Navigator. So I'm going to call it the Navigator cabin. At first glance it appears to be pilot house shell. But there is more to it than that. I didn't pay much attention to the idea until I saw Richard Spelling's Bolger designed Chebacco Light Cruiser which had the Navigator cabin at a messabout in Houston last September. Nothing like seeing the real thing. The original Chebacco has been around for a good while, maybe 20 years, being invented as a large daysailer with a small cuddy cabin. I think the first were cold molded in a professional's shop but since then the plans have been reworked more times than a WW2 fighter airplane's and there are lapstrake and taped seam plywood versions, some with nearly full houses. Richard runs a website for Chebacco news at www.chebacco.com. 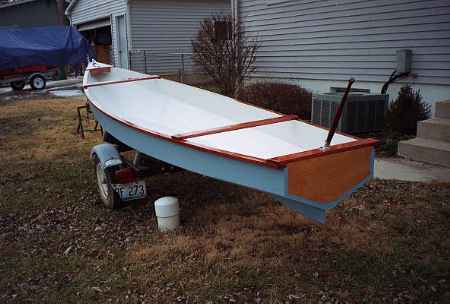 Here is a photo of the original daysailer cuddy version, this one by Jamie Orr. Looking back at the photos you can see that the Navigator cabin has an aft bulkhead about where the original cuddy bulkhead was, and then the cabin sides and roof run aft to form a protected nook. So the cockpit is about half open and half sheltered. Very nice. So as a living space you can see the great advantages of such a cabin. I think there are some disadvantages, very similar to my experiences with the Birdwatcher. You must have curtains for all those big windows for real privacy. The skipper has to see ahead through two sets of windows. So the optical qualitity must be good. The windows usually must be tinted to keep the cabin cool. So sailing at night, looking through two sets of tinted windows, will be more difficult. No shades or curtains allowed either during sailing, so cabin privacy is none then. Also, the window plastic is expensive. I made my Birdwatcher windows out of 1/4" Plexiglass as shown in the plans and I think the cost in 1988 was over $500 which was about 40% of the cost of the hull. Most guys seem to be using Lexan now. Lexan is harmed instantly and permanently by some common bug sprays as Richard and others have found. Although it is more impact and crack resistant than Plexiglass I think it is softer so more prone to scratching and impossible to polish out. 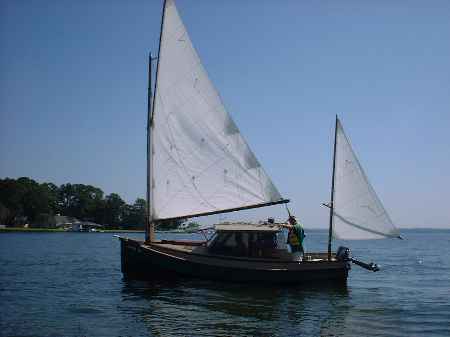 Back when my Birdwatcher was brand new I had it out on Carlyle Lake on a day with very light winds. A fellow in a Flying Scott chased me down, a very easy thing to do for a Flying Scott. He thought the design was quite clever but for an entirely different reason than why it really is clever. From a distance he mistook the tinted glass for screens and he thought the boat was totally screened in, I suppose it might be renamed Bugproof! Of course the screened in Birdwatcher would swamp and capsize in a knockdown, unlike the real thing where the solid windows do the work of keeping it dry and upright. And so it is with Navigator cabins. The windows must be watertight and strong enough to float the boat. The only opening windows or doors allowed would be on centerline. The effect on self righting is quite powerful even for a short cabin, as long as the Navigator section is tall. Here is a drawing of Jukebox2, a design I did about ten years ago. None were built that I know of. 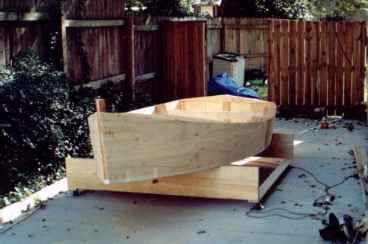 It is a 19' flat bottomed scow hull with ballast and a raised cockpit deck. 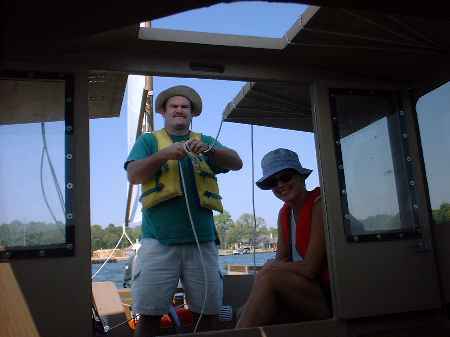 It has a private cabin and a small raised deck in the bow with a step through bow transom for easy boarding after beaching. Here is chart of Jukebox2's righting moment curve as calculated by the Hullforms demo program (there is a link to the Hullforms site at the bottom of this web page) for a center of gravity location of 24" above the hull bottom. A word of caution here. I think Hullforms does a very exact job of these calculations but the calculations of weight and cg location can be really nebulous, in fact just varying the crew can change things a lot. Just having the crew move around in the boat can change things a lot. So it looks like Jukebox2 is very marginal at righting from 90 degrees of heel. Next I took Jukebox2 to make Jukebox3 by adding a small Navigator cabin. Looks a bit like an old fashioned telephone booth but it goes full width of the hull. This one is only 30" long and doesn't have the "nook" in the cockpit as Richard's Chebacco has, but the nook could easily be added. Also I rearranged the cabin slightly to maintain the privacy in the forward part. So you see the effect of this short Navigator cabin is to give the hull a boost as soon as its windows get into the water. The effect is quite powerful. In the final Jukebox3 design the effect allowed me to get by with water ballast instead of iron ballast (iron ballast is a lot denser and can be set lower in the hull making it more effective). Next time we'll look at ways to guess at the weight of a new design. This one is the third iteration of a design called Jukebox that I drew about 1990. The first had the same hull as Jewelbox but had the solid cabin, aft deck and ballast of the usual small cruiser boat. Jukebox2 was the same only slightly narrower at the bow. This one is the same as Jukebox2 but has water ballast and a cabin extension that allows standing headroom in part of the boat - a Bolger "Navigator" cabin. The cabin extension has the great benefit of giving you a place to stand and hang out on a rainy day. 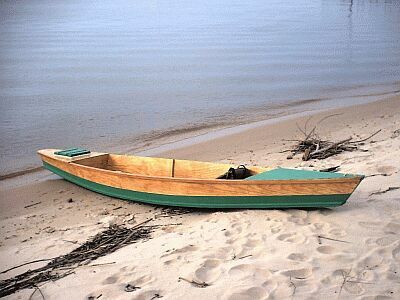 It also allows the boat to be self righting with a lot less ballast. In this case it meant that about 600 pounds of water might allow it to right from a 90 degree knockdown. The cabin extension must be strongly glassed and remember that the skipper has to look through all the windows to see ahead. This boat could be built with no real partition between the two cabin sections but I drew it as I would built it for myself, with a bulkhead between the two to provide more privacy in the main sleeping room. 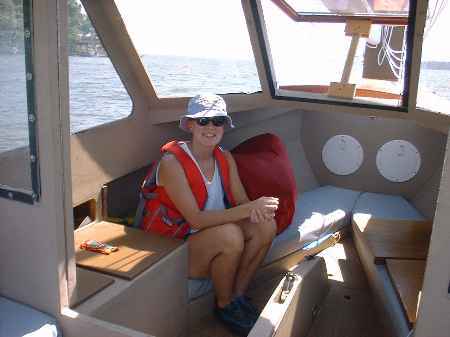 The cabin has a slotted roof so you can walk through it upright, a small step up to the fore deck, and then a small step down through the anchor well and then out the slot in the bow transom with dry feet right onto the beach. A landing craft. 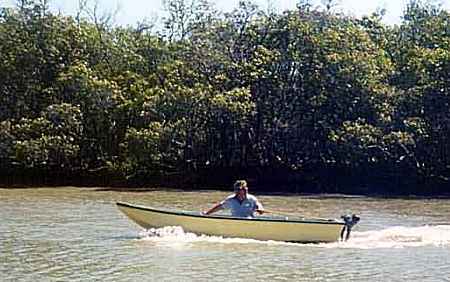 It will be a great beach boat for everyone and don't underestimate how much your family hates climbing up and down and through the water every time you might beach a conventional boat. The sail rig uses the balanced lug main that I like so much. The main mast is 20' long setting 160 square feet of sail. It steps off center so you can walk right by it as you exit to the beach. Jukebox3 uses a rather large pile of plywood with conventional nail and glue construction. Ten sheets of 1/4" plywood and eleven sheets of 1/2" plywood. That would be about 1000 pounds of plywood. Prototype plans for Jukebox3 are $35. 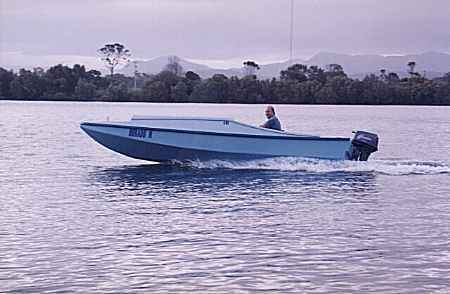 The Australian Dorado builder is done and is testing. Write up in the next issue. The Australian Twang builder is done and is testing. The Oracle builder in St. Louis is done, waiting for a foot of lake ice to melt. 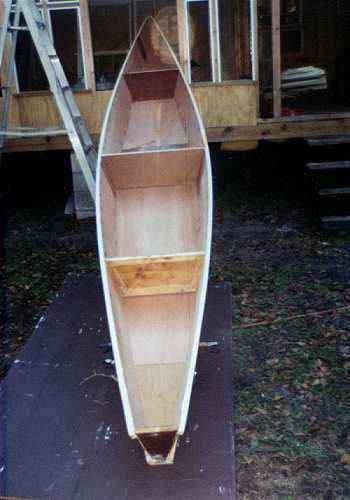 Here is a Skat 12' catboat started in Alabama.